The Queen's Diamond Jubilee year inspired the publication of a trio of books dedicated to her jewels and clothing: Diamonds: A Jubilee Celebration (which I reviewed earlier here), Hugh Roberts's staggering The Queen's Diamonds (which I will review soon), and today's book, Dressing the Queen: The Jubilee Wardrobe. While the two books on Elizabeth II's diamonds focus more on the history of the objects themselves, Dressing the Queen tells the story not only of her clothes and jewels but also of the staff who make her immaculate appearance possible at each public engagement. For jewel lovers, the book offers more than ten pages of photographs and content that present a unique behind-the-scenes look at the jewelry worn regularly by the Queen. The books on the diamonds give us a great deal of information about their history; this book shows us how they're actually used today. The jewelry section opens with two full pages of photographs of brooches worn by the Queen, including her Cartier clips and the Victorian bow brooches. There are also detailed photos of the Queen's rubies, aquamarines, pearls, and sapphires, plus a photograph of the Girls of Great Britain and Ireland tiara and some of the queen's diamond necklaces. We also get to see the way that these stunning jewels are presented to the Queen so that she can choose the specific pieces that she wants to wear: on a tray with a lace cover hand-sewn by Queen Mary. Kelly is also the person in charge of the day-to-day maintenance of the Queen's jewelry, including inspection and basic cleaning. (The big, complicated jewelry issues are left to the crown jeweller.) Kelly's hands-on relationship to royal jewels gives us my favorite jewelry tidbit from this book: a series of photographs of Kelly working with the Vladimir tiara (pictured above in a photograph from 2006). The photos and accompanying text explain how Kelly swaps out the tiara's pearls for the set of Cambridge emeralds, and the images allow you to see how the individual pearls and emeralds are stored (in numbered pouches) and how the pearls and emeralds attach to the back of the sparkler. This section is my absolute favorite part of the entire book -- I love seeing the way that royal jewels "work," for lack of a better word! 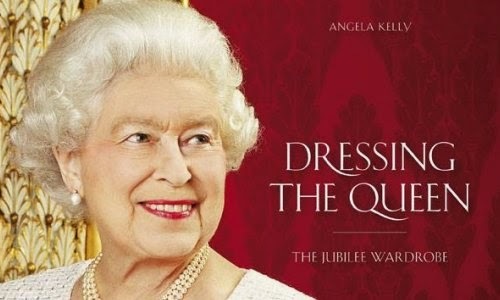 The book closes with a series of photographs of the various outfits worn by the Queen during her jubilee celebrations, including the elaborate ensemble she wore during the Thames river pageant. These outfits are discussed in minute detail, and original sketches are included. We get occasional tidbits of new info from Kelly -- the way she worked directly with Danny Boyle's team to create the perfect outfit for the complicated Olympics opening ceremony film and appearance, for example -- but overall, Kelly is just as circumspect as you might expect a loyal member of the Queen's staff to be. This is a fun book -- and a relatively inexpensive one, at under $30 for a new hardcover copy -- and for those interested in royal fashion, it's a no-brainer purchase. I also think it's a nice addition to the collection of those who love royal jewels, too, as it provides a unique perspective on the everyday use of the jewelry. (And if the Vladimir tiara is your favorite? Buy it now!) Definitely recommended. 1. Cropped version of the cover of Dressing the Queen; source here.